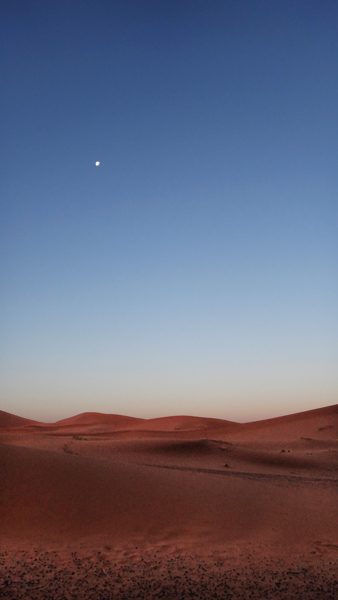 When we first decided to head to Morocco I had visions of the Sahara desert in my head. I pictured us riding camels under the night sky salted with millions of twinkling stars. I was determined to get us that experience, so I began to research how exactly to obtain this little idyllic vision. 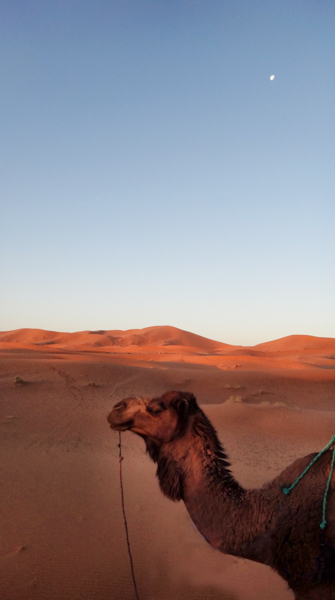 My research drummed up dozens (not an exaggeration at all, probably over 50) different tour companies that offered a “Camel Trek in the Sahara Desert”. 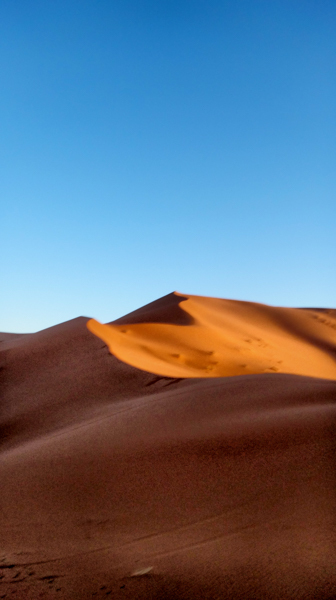 There were two options – 1 night or 2 nights – but I had read that the 1 night trek took you to Zagora, where the smaller of the two Saharan dunes are, while the 2 night trek took you to Merzouga (where the Erg Chebbi dune is). They’d pick you up from your hotel in Marrakech, take you on a scenic drive down south to Merzouga, which is a little village on the edge of the desert. There you’d hop on a camel, trek out to a Berber camp, spend the night under the stars, and then trek back in the morning. After that, they’d let you shower and clean up, and then they’d take you back to Marrakesh (or even Fez if you preferred). All this for about 900 Dirhams ($120 CAD) per person. “Awesome”, I thought! It sounded like a perfect package allowing us to see the countryside and also get our little slice of the Sahara. I scoured through reviews on tripadvisor where so many people said it was the most amazing experience. I noticed a lot of people said that the highlight was the night in the desert, and that the rest of the tour was less than stellar, so I started to wonder if maybe we could skip the package and do it ourselves, and even save some money too. From this I learned you could get yourself to Merzouga for quite cheap if you took the Supratours bus out of Marrakesh – but that bus only runs once a day and leaves in the morning, taking 12 hours, delivering you to Merzouga at night – too late to do a camel trek, so you’d have to spend the night in Merzouga and set off the next day after booking something when you arrive. I wasn’t keen on wasting an entire day on a bus, and burning another day in Merzouga after arriving, so I wondered if maybe we could get down some other way. The only other option was to rent a car – and after reading lots of forum posts about how amazing it is to stop at all the cool places along the countryside, I was convinced that this would be the way we would explore Morocco. We looked at a possible route and intended to take 2 or 3 days to get to Merzouga, driving a few hours each day and stopping at small villages (what many people who had done the drive stated was the highlight). I contacted people in Merzouga on Couchsurfing.com and they all said the same thing – don’t take a tour, drive down instead. We started to look for car rental options in Marrakesh. There’s the big names (like Budget, Hertz, etc) and there are some local companies. We wanted to ideally drive down to Merzouga, leave the car there, and then from Merzouga catch the night bus to Fes (saving us a night’s worth of accomodation!) None of the big names had the option to drop off somewhere remote like Merzouga, and we weren’t keen on driving all the way to Fez (another 9 hours of driving). We tried a few local companies who said they’d allow us to drop the car off in Merzouga, but we’d have to pay the cost of sending a driver down to pick the car up and drive it back (110 Euro, they quoted us). They were all quoting between 250 and 350 dirhams a day (around $30-$45) and we factored in cost of gas, plus that added surcharge for dropping the car off in Merzouga, leaving us with 3 days of car rental costing around $70/day. Add to that accomodation and 3 meals, and we were looking at $110/day or more for 3 days. It was going to cost more than the tour, but we thought it’d be worth the extra expense (the tour would be $240 for the two of us, and this was going to be $330, plus the cost of the camel trek in Merzouga). We made our decision and headed to the rental company to book a car. But the lady working there told us that they had no cars available for that day, or tomorrow, and that she couldn’t say when a car would be free. I was confused – we had been there the day before and she had said we could rent the Fiat Punto for 250/day – what happened to our Fiat Punto? Thwarted, we headed back to the hotel to see if we could book one of the other rentals – but there was nothing. I’m not sure why, but it seems that since it’s the week before Ramadan, no rental cars are available. We couldn’t secure anything in Marrakech. After all that research and wasting an extra 2 days in Marrakech just so we’d be able to do the car rental, it wasn’t going to be possible and we were forced to book the tour. Check out my review of the tour and why I wholeheartedly recommend you avoid it.